Living Room: Pretty much done except for sanding/painting floors. Formerly stinky blue carpeting, peeling, dirty walls that wouldn’t take paint. I sat down at the computer about an hour ago and started writing what I intended to be a quick catch up post, filling you all in on "the new house" that we’ll be moving in to shortly. I wanted it to be nuts and bolts with a bunch of pictures. But as writing late at night will do to a person, it turned into a very long version. An unloading session of sorts. An "I should have been telling you guys about this all along and now there’s way too much to say" kind of post. So instead of deleting it and losing all those thoughts and feelings and impressions, I gave it its own page and gave you a choice. Want the nuts and bolts? This post is all you need. Want the long, sitting in my living room catching up with a good friend version, it’s on its own page found here. Or listed on my right-hand sidebar. The first thing Dan did? Rip up pink carpeting from the stairs. We’ve been living in a two bedroom apartment on my grandparents’ farm for the last two years. It’s been a wonderful blessing to be here, be close to my grandmother, my father, my family and live in such a beautiful place. But at the same time there have been hard things, like the fact that my bedroom is technically in the living room, the living room is technically in the kitchen and my desk is technically at the front door. Oh, and I have three small children, and my wonderful husband up here in the garage apartment, too. The kitchen–will have to wait. Can’t afford to do everything. I’m cursed with another white floor. So we’re moving just around the corner, almost within sight distance, to a small farmhouse on a few acres. A generous opportunity given to us by family. A fixer-upper on the inside, and a lot of mowing and gardening on the outside. The dining room: Rotten floor, as in fall through to the basement. Still very much in progress. The new floor is shown in the living room shot. It’s acclimating and waiting for "work week". Dan has done all the work on the house by himself. It has been long. It has been hard. He’s been away from us to work on it a lot. But what would I do without him? The "six and under suite". Pegs were a little surprise to me, from Dan. I want them everywhere. Really. This weekend he’s going to Wisconsin, getting a big old moving truck and bringing all our stuff out here. We’ll move in shortly after. His brother, also a carpenter, is coming with him and staying for a week to work on the place, too. The upstairs bathroom. Scares me. I can’t wait to be reunited with all my things that have been in Wisconsin storage. I might shed tears. I’m excited. I’m anxious. I’m ready. Though it’s all a little bittersweet, closing this season of living on the farm. But a new season is just around the corner. Oh, how exciting! I wanted even more than the long version… I’m so happy for you. A little extra space can go a long way, I know, and I know how I can feel after just a few days inside our little space (with just the 2-3 of us on any given day!). We’re in a very similar situation, with a very similar project in the works soon and I totally get waiting to talk about it all… I love everything you showed– All of the promise and history and all of the beautiful details. I can’t wait to hear more and I’m so happy for you all. Woo hoo! YAY! I am so excited for you! I love your posts, you write in a way that is very relaxing and easy to read. I love your blog! Keep us posted on the house! My husband and I purchased an 80 year old home last May. We love it. It is our work of art, we love it! Long version wasn’t long enough. What a beautiful post. Some of the beautiful pictures of of your lane have stuck with me for months so I can see how you would be a bit sad. I can’t wait to see all the new lovelyness your new place will hold. I wish I lived closer, I’d swing by to help move that crate and barrel sofa in scrub the blue bathtub. wow- this is just so wonderful. you are living where I want to be! well done on 2 years of patience, looks like your reward is waiting…no matter how rotten the floor may be :). Oh, HOOOONEY, this is going to be so good. I cannot wait to see how this unfolds for you… and I think it’s a good idea to break out the long versions sometimes because you don’t know who needs to hear exactly those things. The long version wasn’t THAT long! Thanks so much for sharing. We were living in a 2 bedroom apartment until recently (with 2 kids) & I didn’t realise how hard it was until we moved into a house, with a yard & space for everyone & everything. Your new home is looking amazing (love the pegs!) & I can’t wait for you to settle in & enjoy it. It will be well worth the wait. Your new house looks fantastic and the countryside is gorgeous. Glad you will finally be settled in your own place–I hate feeling “in between” so I can’t imagine 2 years of it. Good luck with the last of the housework and the move. The countryside is beautiful and the house is fantastic. Molly– I really loved reading the “long version” of your thoughts and feelings, of what has been and what is to come. I look so forward to seeing how you make your new home yours, and I really understand that it is a big deal– there will be shifts in balance and routine. I wish you deep breaths of grace in these intense weeks. I can’t wait for the move! After the bridge gets fixed you will be so close to us :)You will love having your own space and all your things back. It will be like Christmas. Have fun with it. I will be stopping by! Oh girl- so happy for you- but for sure understand the crazy times- My husband is master carpenter and I have lived in reno land in two homes in last four years with two kids…I have a blog on my main site that is my trials with home reno (encorelady)Godspeed the mess and worry – OK? I understand! But…Yahoo for a farmhouse! This looks like something that will be brill at the end of process!!!!!! This is so exciting! I’m trying not to be jealous, because really, that is what I have ALWAYS wanted to do — nasty kitchens, baths and all — but never will. Hubs is not a project guy. Oh, how I will enjoy hearing all about it!!! you know i read the long version. i just wish i could be there to help you move or watch your girls or do whatever it is that needs to be done. i am beyond thrilled for you, molly. it is going to be so great! Hello again. Back from the long version. And I’m in tears for you! Tears. Tears? yes! What a special, magical time this will be for you. loved the long version. horray for you and your family and your home-to-be. your grandmother must be an amazing person having raised all those children. my grandmother (bless her) raised 13 and i am so in awe of that…. I know about that small space you’ve been in and while it is very charming to visit I’m sure it can feel very cramped to live in. The farm is a special place so I know you’ll miss being part of it too. But, soon your day will not be ruled by what’s happening on the farm and I think that you will enjoy that more than you know. Now, you just tell me when that moving truck is pulling up and we’ll be there to help unpack. No waiting for the house to be presentable. I’m serious, friend. I just found your blog this morning after following a link from Creative Little Daisy. I have enjoyed looking around : ) I also homeschool and love to create, so am really looking forward to following your blog. Oh Molly! This is fantastic! You beat us to the getting of a farmhouse though. :)I’m so happy for your family. Can’t wait to hear and see more. Oh My Gosh what beautiful place! I love the fire place. Congrats and good luck on all the hard work you all have in front of you! I’m so thrilled for you Molly! !You are living my dream, fixer-upper and all. I can’t wait to follow the progress here and live vicariously through you…as if I haven’t been already,LOL.Hurray for your little slice of MD, countryside heaven! your story reminds me so much of visiting our house while it was being built – the feeling that it would *never* be finished (it took over a year) – see each small thing get done and feeling a sense of victory! along with a sense of .. never-ending more more more needs to be done. blessings to you & your family in your new home! Yay, Molly, how exciting! How old is the new house, anyway? It looks like it has some serious character. I’ll take an old house over a new one any day of the week. We’re moving to a new state this summer; we’re hoping on just another year of apartment living before we buy our own little place. Granted it’s just the two of us, plus cat, but still. Oh wow! I am so amazed that you’ve been able to do so many creative things in the space you’re in now. With three children, and homeschooling, to boot! You are a super-talented, super-blessed, super-inspiring woman! YAY! For you. I read both versions, and you are eloquent, Molly. It looks absolutely AMAZING! What year was it built? Mid-1800’s? So neat! My husband restored old houses for a living, so if you have any questions, I’m sure he’d be happy to help 🙂 Good luck!! 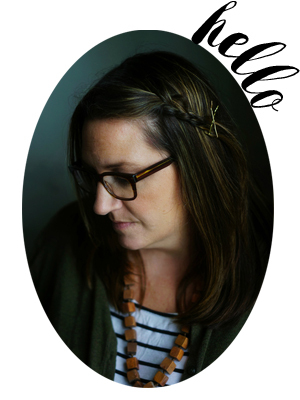 Hi just wanted to say I stumbled on your blog today (from Creative Little Daisy) and I love it! We homeschool too and I’m going to have to go through more and check out some of your great ideas. I love your writing style – so great to read!The “new” house looks great! Hi Molly, Dan is amazing! Hope this weekend goes well with getting the stuff out of storage and driving back to MD. After we moved here, our things were held hostage by our shipping company for 14 weeks and there were times we thought we’d never see them again…and I can totally relate to your feelings of an early Christmas. But 2 years! I can’t imagine being without for so long. You’ve been a champ. It will be great to finally settle in and spread out, keep us updated! so exciting molly! love the white walls and brightly painted trim, and of course the pegs!!! just can’t understand why you’d get rid of the pink carpet :). can’t wait to see and hear more. wow, i love the long story. what a great romantic tale! i love the new house, and can’t wait to see the magical life you will create there for your family. Oh, I am very happy for you! Wonderful, wonderful, wonder-full. It’s all so lovely, Molly! I loved the long post and think it’s easily your best writing. Congratulations! I will remember you in prayer this next month. And will definitely appeal to Him to provide a buyer soon for the Wisconsin home. I’m sure that will lighten things and maybe even free up money to do what you want to your kitchen. I, too, hate light-colored floors. They’re beautiful if you don’t have children, of course. We had wood laminate put in our kitchen when we moved to Ohio three years ago; it’s easy to care for. good for you!!! how wonderful to know you have a place LARGE (LOL) enough to call home! it looks intriguing and exciting and gorgeous! Oh, wow! It’s looking great! Such excitement!! I shed tears reading your long version. Probably because I’ve moved so many times myself and know that bittersweet feeling of being ready for the new adventure and being sad at the loss of a life you will never go back to. I can’t believe that you’ve held that all in until now. I would be SO EXCITED right now-the house is stunning. You will always be able to treasure the time you’ve had being a part of your family’s life, but now is the time for you to really establish your own family. Good luck with everything. I hope it all goes smoothly. just the best. wishing you every joy and happiness in your new home. reminds me of the make new friends but keep the old song–you may never live that way again, but for a short while it was perfect. you are a truly fortunate family. Love the photos of the new home! How sooo exciting to be moving in. I also agree that the pegs on the walls need to be everywhere but my hubby doesn’t agree with me. I’m a lurker coming out of the woodwork Molly. I just read the long version and wanted to share a bit with you. You are right: it will be different. We did a multi-state move just over 2 years ago and though we loved our house from the get-go, it is just now starting to feel like home. Give yourself a chance to soak it all in and get settled at your own pace. Enjoy making it your own. Your life and words are so beautiful that I know this new home will be too. I sincerely wish you all the best in your new home, and with this new start of your life. Thank you for sharing all of your thoughts in this space too. I so hear you with this post. And with every fibre of my being I wish you all the very best in the new place. This all speaks to me because we too have recently moved from a place of similar proportions, similarly bucolic and similarly, teeth-gnashingly tiny. Desk in the doorway? I hear you.Well done you for surviving it and thriving upon it. Your posts are always so brilliantly optimistic, I had no idea the circumstances you were living in.Onwards and upwards from here. I’m new here…I read the short and long version and enjoyed them both! What an ordeal you’ve been through, especially with young kids! I envy you too because this has always been my dream too, but in reality we are not good “fixer uppers” so it would only be extremely frustrating. Can’t wait to see more pictures! ~From you “neighbor” in Virginia! SO happy to have both stories! I love the long version. The house looks like it’s going to be an amazing place to start anew and fresh. Beginnings are always hard and wonderful at the same time. I can totally relate to living in a place that has been offered and feeling grateful but also pining away for a space of your own. We lived with my parents for 6 months when David came home from Iraq and it was so wonderful and difficult. We were so happy to be able to stay but even happier to go. Now we find ourselves in an apt in the city a year and a half later. We are so happy it was here for us when we needed it it, but are now pining away for a small farm in the country. We are hopeful that that opportunity presents itself with the entrance of fall. So happy for you and your family and your new found space.